Chemo-mechanical magneto-rheological finishing (CMMRF) is a hybrid finishing process of CMP (chemo-mechanical polishing) & MRF (magnetorheological finishing). 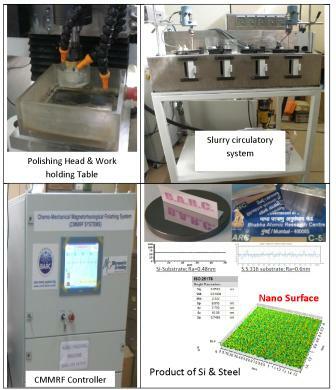 CMMRF machine has been developed to generating atomistic or nanometric surface on various engineering materials. It comprises Controller, 3-axis CNC-based machine, slurry system, finishing head, and working table. The process is flexible finishing process, which would be employed to finish flat surfaces in order of nano to sub-nano metric level. Finishing pad life is endless (there is no need to use conditioner on the pad). And chemical aspect of finishing introduces atomic level of surface finish (less than 1nm) and very high finishing rate as compared to other existing process. General optics, LASER Optics, Soft X-ray Optics, Hard X-ray Optics, High speed rotor, Micro-fluidic devices, Micro-tools, Metrological-probes, Micro-fabrication platform for R&D, Dies & molds, MEMS & NEMS fabrication, IC chip & microelectronics fabrication, LINAC RF Cavity, Hip joints, Knee joints, Stents. Preston (1927) has modeled of CMP process: → Polishing rate (PR) = KPV MRP fluid�s model is assumed by consideration of its rheological behaviour similar to the Bingham plastic fluid: → Abrading Shear stress = t = to + μ(V / g) Where K = constant of chemical reaction; P = polishing pressure on abrasive; V = polishing velocity; g = working gap; t = shear stress on the MRP fluid at finishing plane; to = threshold shear strength of MRP fluid; μ = dynamic viscosity of MRP fluid. Since polishing pad (brush) is generated by MRP fluid, pressure (P) is being generated because of magnetorheological shear stress (τ) action. This conversion of the shear stress into polishing pressure can be comprehended by fluid hydrodynamics. Figure 1 shows combined effect of CMP and MRF, whereas, chemical passivation and subsequent magnetic assisted mechanical abrasion is also presented. The CMMRF system includes Precision Orientation Table, Polishing head, and Slurry system with controller. 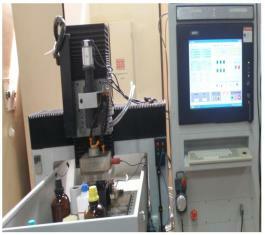 This system should be mounted in any 3-axis machine to perform finishing operation. Precision Machining, Metrology, Fabrication, Electronic fabrication & testing and Assembly facility. This is novel work in field of advanced manufacturing technology. Development of this facility needs people whose areas of expertise belong to precision machining & assembly, fluid circulatory system, and ‘electronics-instrumentation & system integration’.